The Magic Kingdom today is just one small part of a Walt Disney World vacation, but this icon of the Vacation Kingdom is what most people think of when you say that you're "going to Disney World." It's big, it's beautiful, and it's a world of fantasy and adventure that has become a right of passage for millions of Guests. However, it can also be a crazy hectic world of bustling tourists all trying to pack the most fun they can into their day. It's always best to have a plan, so I thought I'd share a few of my top tips for touring this Disney classic and offer up a couple secrets of how I tackle a day at the Theme Park. Pack a great day bag full of any essentials that you may need. Water bottles, sunscreen, a small first aid kit, and some inexpensive light snacks to munch on in case you get caught in a queue and your tummy starts to rumble. Try to visit the Magic Kingdom mid-week, because most families hit the Magic Kingdom early in their Disney visit. Tuesdays and Wednesdays are a good bet, but keep in mind that there are some times of year that the Magic Kingdom will be crowded no matter what day you go. Be at the Magic Kingdom Park entrance at least 30 minutes early so that you can join in the park opening "rope drop" celebration. At Town Square, near the entrance, pick up a Guide Map and the Times Guide, which lists show times, character greeting times, and any special hours for attractions and restaurants. However if you'd like that information and more in the palm of your hand, be sure to download the MyDisneyExperience App. The MyDisneyExperience App can also help you manage your dining reservations, overall schedule and change, modify, or make new FastPass+ Reservations. Check the Magic Kingdom tip board near Casey's on Main Street U.S.A. throughout the day for the current wait times for the most popular attractions. At time of publication there is the possibility that this may be removed, which is just another reason the MyDisneyExperience app is becoming a must have at Disney World. For a higher score on Buzz Lightyear's Space Ranger Spin be sure to keep the trigger depressed at all times, and aim for the most distant targets! If you can't quite bring yourself to book at the Pirate League or Bibbity Bobbity Boutique, the Harmony Barber Shop on Town Square in the Magic Kingdom will put glitter or paint in your kids hair for just $7.50. Harmony is currently closed for a refurbishment but should be open for business again March 30, 2015. Guests of all ages can get a haircut at the Harmony Barber Shop located beside the Car Barn on Main Street. For children getting their first haircut there is a special certificate given out. Harmony is currently closed for a refurbishment but should be open for business again March 30, 2015. 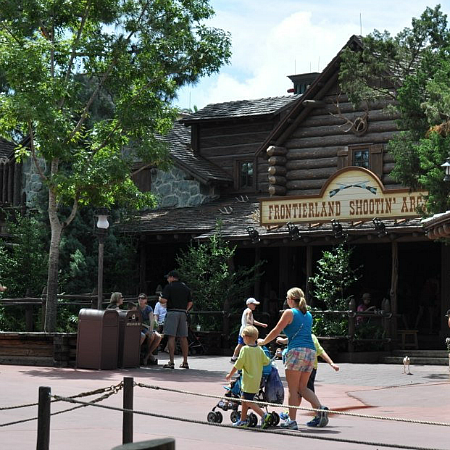 Grab a spot in Frontierland near the Shooting Gallery for a great parade view with fewer crowds to fight. 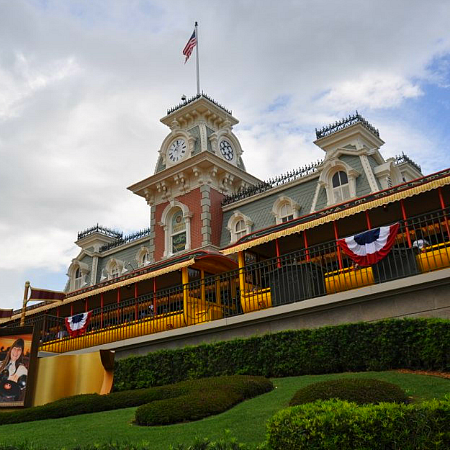 Be sure to stake out your spot at least 30 minutes before the parade is scheduled to begin. This is my personal favorite spot for parade watching. The Magic Kingdom is always most crowded in the mid-afternoon. This makes it a great time to take a break. Try some of the more relaxing, less crowded shows and rides during this time. Our favorite Attractions To Relax On include such classics as the Carousel of Progress, Hall of the Presidents, or TTA People Mover. Once done there, grab a late afternoon snack and you'll feel ready to get back to some serious touring. Some of Disney's most famous foods are found at the Magic Kingdom. Be sure to try at least one of these tempting treats, such as: Turkey Legs, Churros, Mickey Premium Bars, and Dole Whips! Shopping on Main Street is at its least crowded in the early afternoon, and most crowded at the day's end when everyone is leaving. Shop in earlier in the day and have your packages sent to package pick-up or back to your Walt Disney World Resort to save time and avoid stressful crowds. Space Mountain, Splash Mountain, Big Thunder Mountain and the 7 Dwarfs Mine Train will usually be the least crowded first thing in the morning. Arrive for rope drop and head straight to your favorite. After that first thrill, be sure to schedule a FastPass+ to get in your ride. If you don't mind missing the parade, queues for even the most popular rides are usually significantly shorter during parade times, especially in areas that the parade doesn't go through such as Tomorrowland, Fantasyland, and Adventureland. Get in the picture! If you have your own camera (or cell phone camera) Disney Cast members will happily take a picture of your entire group, all you have to do is ask. This means that whoever usually takes the pictures can look like they've been on vacation too when they share them back at home. Don't have your own camera? Look for Disney Photo Pass photographers and they'll be happy to shoot a picture of your clan. With a scan of your magic band you can retrieve it later online (for a price). The Plaza Restaurant Terrace can be a great place to view the Fireworks from, make advance dining reservations for 30-60 minutes before the show starts. This will be an especially coveted spot once the hub construction is finished later this year. You can get into line for a ride right up until the time the Park closes. This is perfect for late nighters that want to make the most of Disney after dark. Some attractions, like the Jungle Cruise and Big Thunder Mountain Railroad have a whole different vibe late at night, they're totally worth the second ride. Main Street and all of its shops remain open for a half an hour after park closing. Take your time and linger, then enjoy the stroll out while everyone else is rushing out. Will you be traveling with small children? Though you can rent a stroller at all of the Disney Parks, your kids will most likely be more comfortable in such an intense environment if they are in their own wheels. Bring your own stroller and a couple of creature comforts to help cut-off meltdowns. 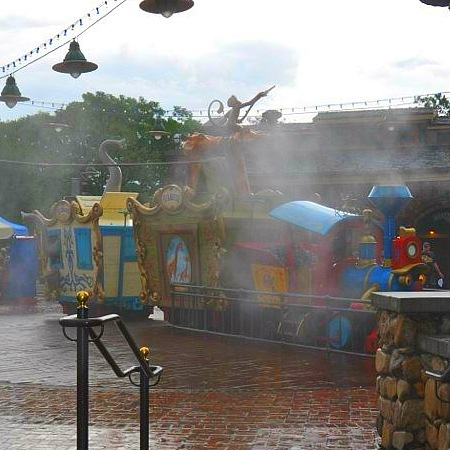 Be sure to pack an extra change of clothes for the wee ones, so that they can enjoy the Storybook Circus, Casey Jr. Splash 'n' Soak station on a hot summer day. Use the "rider swap" program, which gives both parents a chance to enjoy the latest attractions without the double wait. After going through queue, one parent waits with a young child while the other parent rides the attraction can get on the ride with minimal wait time once the first parent comes off. That's it! 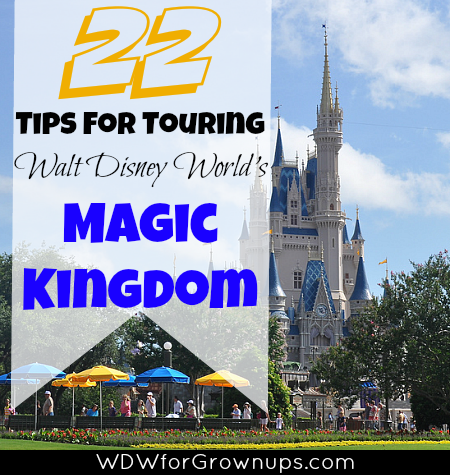 22 Top tips for touring Walt Disney World's Magic Kingdom Park. For more details and information about the things we've discussed be sure to click the links within this article. They'll take you to full length pieces that we've written on the topics. Do you have any tips to share with our readers? You can leave your top tips in the comments below. It seems simple and obvious but WEAR COMFORTABLE SHOES!! The biggest complaint one hears riding back to the hotel "my feet are killing me!" 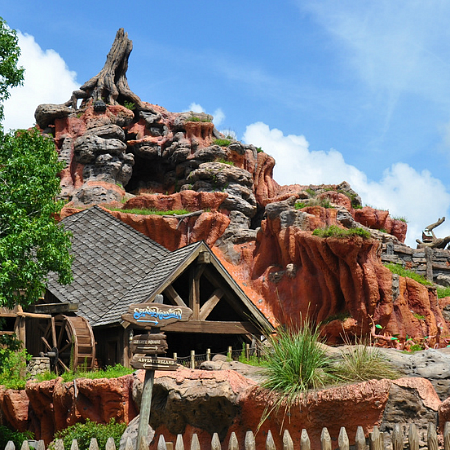 If you plan to go on a wet ride (think Splash Mountain), pack a disposable towel in your daypack. Maybe a dishtowel from home you don't mind losing. You can use it to dry your seat before sitting down so it doesn't soak all the way through your clothes. When done you can just toss it in the trash.